Halloween is close and geeks couldn’t celebrate it in any way than with the Halloween gadgets. From Bloody Hand Foot Mouse Pad to LED Eyelashes and Pumpkin PC, you can choose literally everything to be the ultimate Halloween geek! And Attention Please: Some of the products / ideas presented here are really creepy and crazy…. 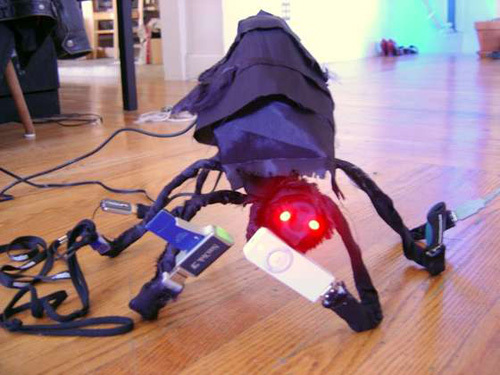 A six-legged monster, that features an USB port in each leg. Looks like a creepy spider…. 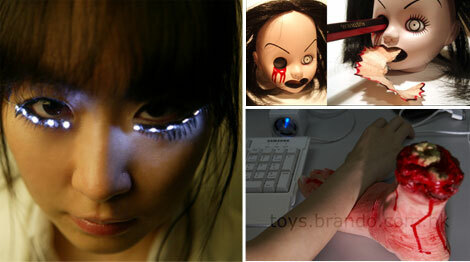 Those awesome contact lenses, Halloween and Special Effects Contact Lenses are from Fxeyes’s. In their website, included over 130 styles. These horrifying contacts let your create any look, from zombie white-outs to intricate cyborg designs and demonic red eyes. Each Halloween contact lens offers exceptional comforts, so your eyes will feel heavenly even when they look hellish. A weird, but innovative PC case for the ultimate nerd to celebrate Halloween. And if the Pumpkin PC case doesn’t make you the ultimate Halloween nerd, this one definitely does – the whole PC in pumpkin. The Rovin Pumpkin has been fashioned out of a pie pumpkin that has been hollowed out from beneath to accommodate the inner workings that make it mobile. Inside, the motion for the little squash based monster comes from 3 Lego wheels attached to a servo motor which is driven by an ATtiny2313 microcontroller. In addition the pumpkin project adds 2 bright green LED’s that resemble eyes for additional spookiness at night. 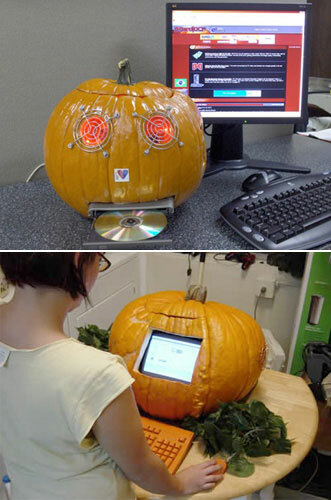 Want to prepare your PC for Halloween, but the Pumpkin case is too much for you ? 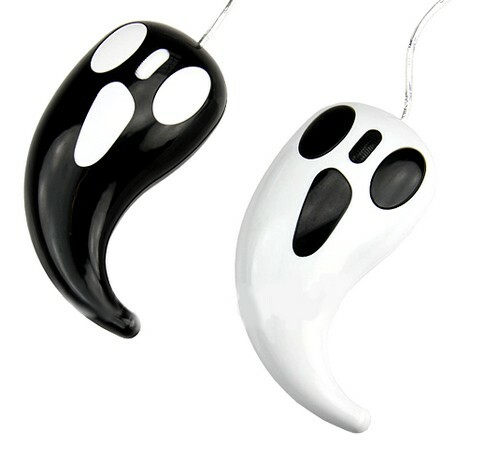 You’ll definitely love the ghost mouse, but unfortunately your hand won’t. 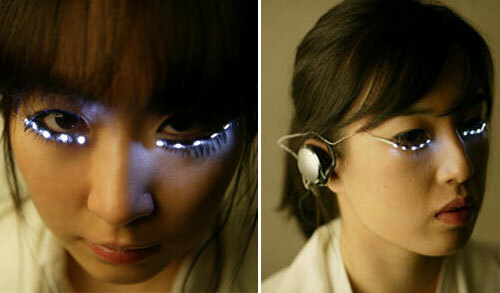 This is one of the craziest halloween gadgets, both by it’s name, design and functionality. The pencil sharpener really works, you stick the pencil into the doll’s eye and it pushes the savings out of her mouth, with a button press. Freak out your co-workers, classmates or girlfriend with this realistic-looking remote-controlled tarantula ($17.03). The creepy critter has light-up eyes, a furry texture and it scurries across any flat, smooth surface with spider-like leg movement. 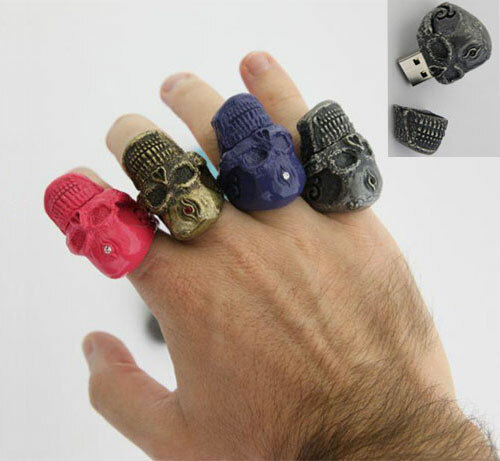 Just in time for Halloween, Japan’s Solid Alliance has unveiled the USB Key Skull Ring. Available in black, silver, pink, gold, purple and blue, the tiny storage device is perfect for the geek who also fancies himself as a dark lord of the night, or just someone looking for a techie accessory for their Halloween outfit. Packing a full 2 gigabytes of gothic style memory capacity. Buble Fogger Machine is, obviously a bubble maker. The distinction? 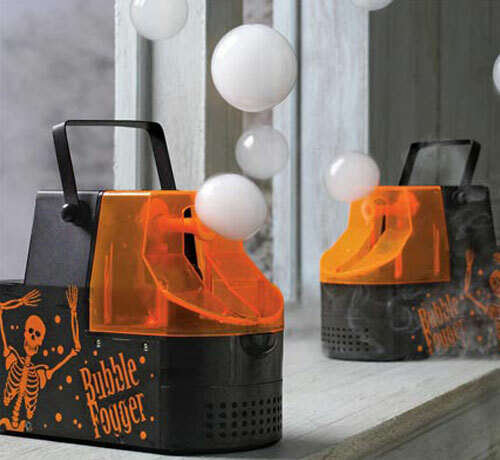 it add up a smoke inside the bubbles so when it burst, it can transform your room to a foggy haunted room! If you are a regular reader, you might have notice the same gadget that produce non-toxic fog. Bubble Fogger Machine is using the same fog, so you are safe from allergic or other health problem. 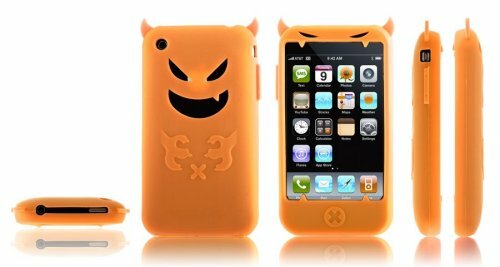 Here are some cool Halloween costumes for your iPhone 3G or 3G S. The Demon Silicone Series Case for iPhone 3G/ 3GS turns your iPhone into a demon complete with horns. In front it looks like your iPhone is being eaten, and on the back there is an image of a demon with hands. And of course, the case glows in the dark. The Demon Silicone Case comes in blue, yellow, white, green, and purple. Now if you can go door to door and convince them that your iPhone deserves candy as well since it got all dressed up, then you’ve got it made. 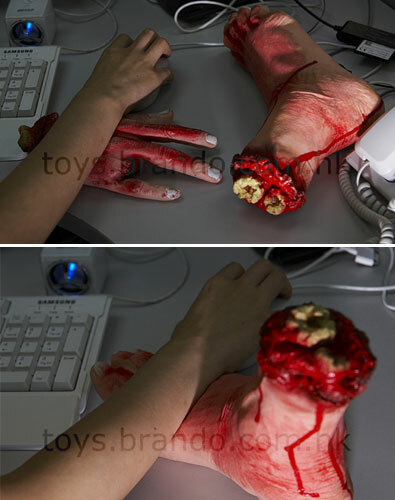 Halloween Bloody Hand Foot Mouse Pad, which is made of soft material and has a 1:1 size ratio for your hand. The broken fingers and the chopped off leg look really gory and would make any peace lover cringe. Of course, the mouse pads are not designed with violent gamers in mind, it could be anyone who likes the sight of blood and mangled body parts, which would be… er.. wackos? This could well be the best Halloween product you could buy for yourself or for your friends, now that the evil night is soon approaching. 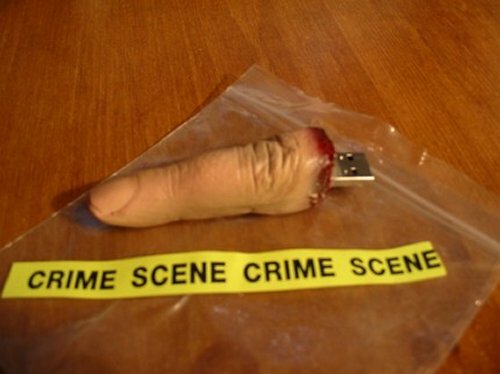 A bit more morbid, but probably great for Halloween or a gift if you want to give someone the finger. From his Etsy shop: “Each finger is freshly cut and removed from the local morgue (no, not really….well…..maybe) and equipped with 1gig of memory. Now, you can finally give that geek in your life “The Finger”. I swear, if I saw any of these I would definitely scream! Previous story Ready to Dress Up Your Pets?